CPT CODE 90669, 90670, 90732 & G0009, G0008 ICD 10 CODE Z23 | Medical billing cpt modifiers and list of medicare modifiers. For more information, refer to https://www.cms.gov/Outreach-and-Education/Medicare-Learning-Network-MLN/MLNProducts/MLN-Publications-Items/CMS1243321.html on the Centers for Medicare & Medicaid Services (CMS) website. When a beneficiary receives both the seasonal influenza virus and pneumococcal vaccines on the same visit, would a provider continue to report separate administration codes for each type of vaccine? Codes 90460 and 90461 must be reported in addition to the vaccine and toxoid codes 90476-90749. Report codes 90460-90461 only when the physician or qualified health care professional provides faceto-face counseling of the patient and family during the administration of a vaccine. For immunization administration of any vaccine that is not accompanied by face-to-face physician or qualified health care professional counseling to the patient/family for administration of vaccines to patients over 18 years of age, report codes 90471-90474. Codes 90476-90748 identify the vaccine product only. To report the administration of a vaccine/toxoid, the vaccine product code must be used in addition to the administration code 90460-90474. Modifier 51 should not be reported for the vaccines/toxoids when performed with these administration procedures. Each immunization given must be filed on a single line of the CMS 1500 claim form, with its specific CPT code. The -25 modifier must be used with all evaluation and management services except preventive services CPT 99381-99397, when reporting a significant, separately identifiable service in addition to the immunization services. It is inappropriate to use the unlisted vaccine code CPT 90749 to report immunization administration services. The invoice from the laboratory or pharmacy the vaccine has been purchased from may be requested for claim review. ZOSTAVAX® (Zoster Vaccine Live), has FDA approval for use in prevention of herpes zoster (shingles) in individuals 50 years of age and older. CMS has data indicating the resource costs of vaccine administrations, yet continues to link payments to CPT 90782 (Therapeutic, prophylactic, or diagnostic injection). It is inappropriate for the agency to continue to link vaccine administration payments to 90782 when CPT maintains a code that describes administration of an immunization and when CMS has data on the resource costs associated with the service. ACP-ASIM has repeatedly asked CMS staff for an explanation for the linkage of Health Care Financing Administration Common Procedure Coding System (HCPCS) codes G0008, G0009, and G0010 to CPT 90782, but has not received a clear answer for this payment rationale. ACP-ASIM also strongly believes that CMS should revise the current coding requirements for vaccine administrations by replacing the HCPCS codes G0008, G0009, and G0010. 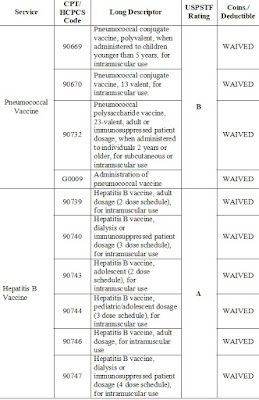 Currently, each of these G codes for vaccine administration is linked to CPT code 90782, and reimbursed by Medicare Carriers at that rate. We believe that CPT codes 90471 and 90472 should replace HCPCS codes G0008, G0009, and G0010 because these codes were created to describe an immunization administration. Using CPT codes 90471 and 90472 to record vaccine administrations will also simplify the coding requirements placed on providers. The majority of private insurance plans require providers to bill for these services by using the codes 90471 and 90472. Medicare’s requirement to use G codes for vaccine administrations is an unnecessary administrative hassle to providers that should be revised. Does a deductible or coinsurance apply for adult immunizations covered by Medicare? n Neither a deductible nor coinsurance applies to the influenza virus vaccine or Pneumococcal Polysaccharide Vaccine (PPV). However, a deductible plus 20 percent of the Medicare coinsurance amount applies to the Hepatitis B Virus (HBV) vaccine. If a beneficiary receives a flu vaccination more than once in a 12-month period, will Medicare still pay for it? n Yes. Medicare pays for one flu vaccination per flu season; however, a beneficiary could receive the flu vaccine twice in a calendar year for two different flu seasons and the provider would be reimbursed for each. For example, a beneficiary could receive a flu vaccination in January 2005 for the 2004-05 flu season and another flu vaccination in November 2005 for the 2005-06 flu season and Medicare would pay for both vaccinations. Will Medicare pay for the PPV vaccination if a beneficiary is uncertain of his or her vaccination history? n Yes. If a beneficiary is uncertain about his or her vaccination history in the past five years, the vaccine should be given and Medicare will cover the revaccination. If a beneficiary is certain that more than five years have passed, revaccination is not appropriate unless the beneficiary is at highest risk. Does Medicare cover the HBV vaccine for all Medicare beneficiaries? n No. Medicare provides coverage for certain beneficiaries at medium to high risk for HBV. These individuals include those with End Stage Renal Disease (ESRD), persons who live in the same household as an HBV carrier, and workers in healthcare professions who have frequent contact with blood or blood-derived body fluids during routine work. When a beneficiary receives both the influenza and PPV vaccines on the same visit, would a provider continue to report separate administration codes for each type of vaccine? n Yes. Although the provider would use diagnosis code V06.6 when an individual receives both vaccines, separate administration codes for influenza (G0008) and PPV (G0009) should be reported. 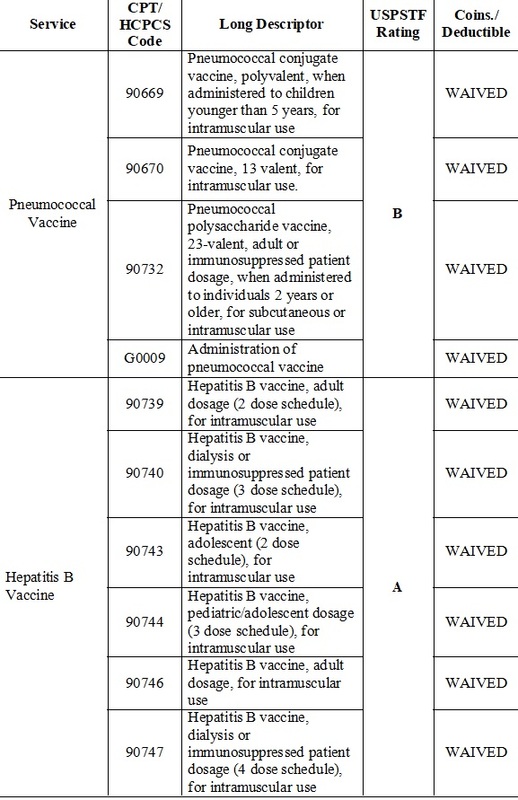 Can the influenza, PPV, and HBV vaccinations all be roster billed? n No. Only the influenza and PPV vaccines are eligible for roster billing. Roster billing does not apply to the HBV vaccine. n A mass immunizer offers flu and/or PPV vaccinations to a large number of individuals and may be a traditional Medicare provider or supplier or a nontraditional provider or supplier (such as a senior citizen’s center, a public health clinic, or community pharmacy). Mass immunizers must submit claims for immunizations on roster bills and must accept assignment on both the vaccine and its administration. A mass immunizer should enroll with the Carrier prior to flu season. Please see the next question for more enrollment information. Do providers that only provide immunizations need to enroll in the Medicare Program? n Yes. Providers must enroll in the Medicare Program even if immunizations are the only service they will provide to beneficiaries. They should enroll as provider specialty type 73, Mass Immunization Roster Biller by completing Form CMS-855I for individuals or Form CMS-855B for a group. • Severe allergic reaction to any component of Prevnar 13, Prevnar, or any diphtheria toxoid-containing vaccine. • Local reactions (such as pain, swelling or redness) following PCV13 occur in up to half of recipients. Local reactions are generally more common with the fourth dose than with the first three doses. • When elective splenectomy, immunocompromising therapy, or cochlear implant placement is being planned, PCV13 vaccination should be completed at least 2 weeks before surgery or initiation of therapy. You have shared such a nice information about the pneumococcal vaccine and it's useful for us, But there are so many other vaccines also available. For more information of any type of vaccines, feel free to ask from Medical Practice Purchasing Group.